As the Southern and Central Coast craft beer scene continues to grow, Ventura has become a hotbed of local breweries. There is no shortage of restaurants and bars in the Downtown area of Ventura that feature a multitude of craft beer choices. However, no such alehouse (or tap house) existed on the east side of Ventura. Cask Alehouse filled that void. 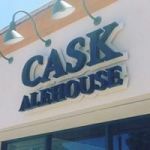 At Cask Alehouse, choice reigns supreme with a constantly rotating selection of 32 beers on draft and several more by the bottle including year round, seasonal, and hard to find styles. In support of the many breweries throughout California and locally right here in Ventura County, Cask Alehouse features selections from breweries as Surf Brewing, Made West Brewing, Topa Topa Brewing, Poseidon Brewing, and Five Threads Brewing. Given the established and prestigious reputation for fine wine on the Central Coast, we offer a dozen or more selections by the glass or by the bottle. All of this is offered in an upscale, comfortable, wood-accented space that attracts a crowd that appreciates craft beer and local wine with a mellow vibe conducive to casual conversation between guests. Taprooms have long been a part of American culture since the 18th century and are synonymous with comfortable gathering places where friends and families enjoy good drink and food. To compliment the beer and wine, Cask Alehouse offers a menu of unique appetizers and sandwiches, fresh salads, and gourmet pizza featuring locally-grown farm-fresh items. We will not offer live music and don’t intend to create a raucous “sports bar” atmosphere. Seating capacity is approximately 90. Paul Miller and Sean Clark jointly own and manage the business utilizing their extensive background in the hospitality industry. Paul is a 23-year resident of Ventura and the founder of the Anacapa Brewing Company.